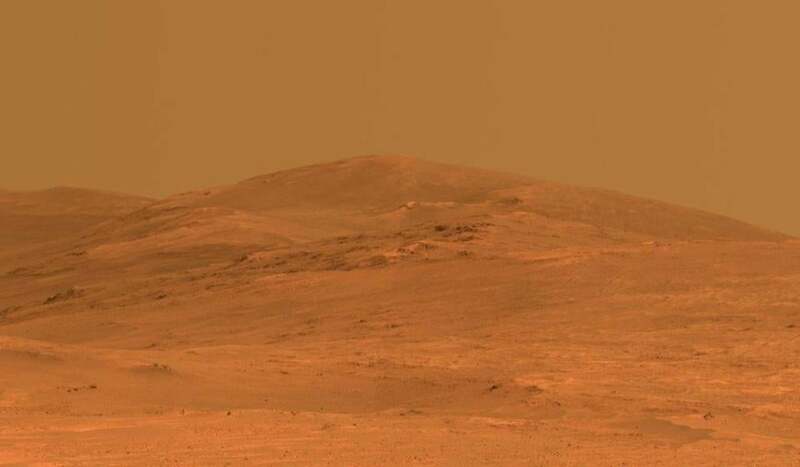 This vista of the Endeavour Crater rim on Mars in a photo taken May 21, 2014. Humans have yet to travel to Mars, but students from MIT and other universities announced Monday that they hope to put tens of millions of people from across the globe on the red planet within the next three years. How? By sending three small satellites, called CubeSats, to the surface with slivers of life from the year 2014 in the form of messages, photos, audio clips, and videos. This digital, global diary of sorts, a mission called Time Capsule to Mars, is the first crowd-funded, student-led, interplanetary mission, its leaders said at a press conference in Washington. The project will test several new technologies and may require new inventions along the way, said Paulo Lozano, director of the Space Propulsion Laboratory at the Massachusetts Institute of Technology. If successful, the effort will advance relatively inexpensive methods of exploring Mars, said Lozano, who is overseeing the 11 MIT students participating in the mission. For the design, launch, flight communications, and vehicle controls — all of which students from MIT, Duke University, Stanford University, and the University of Connecticut will lead — the project is expected to cost $25 million. The students are working with Explore Mars, a Boston-area nonprofit that promotes Mars exploration, and are getting additional support from NASA, Lockheed Martin, and Boeing. Astronauts Edwin “Buzz” Aldrin, Kent Rominger, and Charlie Precourt are serving as some of the project’s advisers. The students will test a new propulsion method to get the 26½-pound satellites to Mars, one of a wave of technological advancements for exploring other planets that could emerge from the mission, said Emily Briere, a Duke senior who is the mission director. Organizers hope to launch the satellites by 2017. President Obama has said NASA would launch a manned Mars mission by around 2030. In the meantime, said Chris Carberry, executive director of Explore Mars, the time capsule project will help spur widespread interest in space and inspire further exploration of Mars. The idea for the mission stemmed from last year’s Humans 2 Mars summit in Washington, hosted by Explore Mars. Briere and other students noticed that many of the summit’s attendees seemed to be more motivated by the fame they would get from being the first to land on Mars, rather than using a mission for technological advancements and a better understanding of the universe. During the conference, Briere, students, and space industry leaders gathered around a table at a TGI Fridays. How can we get more people excited about space, they asked one another, while engaging a larger audience in space exploration? Enter Time Capsule to Mars. “We wanted to remind people we go to space to push forward humanity,” Briere said. “A lot of technology came from the Apollo era,” she said, such as wireless headsets. The greatest challenge lies in getting the CubeSats to Mars, Lozano said. Most of the technology needed is new and untested, he added, elevating the risk that parts of the mission could go awry. Despite the project’s complexities and many unknowns, students and industry leaders said they are confident in its success. If the time capsule does land on Mars, then millions of people can say they were a part of it. The group has a website, timecapsuletomars.com, where people can make donations and will soon be able to upload materials for the time capsule.